NJ Soldiers – What Exit? On April 6, 1917, one hundred years ago, the United States entered The Great War (as it was known then) or the First World War (as we know it today). New Jersey contributed 72,946 draftees and 46,960 volunteers—with more than 140,000 serving by the war’s end—for the final seventeen months of the war. Although the Garden State is teeming with over 160 memorials dedicated to the brave individuals who served in the Great War, their names were largely forgotten until recently. In this blog post we will feature two of these long forgotten New Jersey heroes, using materials from the Rutgers College War Service Bureau and the Terradell Family Papers at the Rutgers University Special Collections and University Archives. These materials, along with many other one-of-a-kind artifacts, are currently on display in “Heaven, Hell, or Hoboken!”: New Jersey in the Great War. 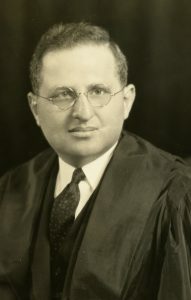 Portrait of Theodore Rosen. Undated, ca. 1926. Counted among the alumni who corresponded with Silvers and the RCWSB was Theodore “Theo” Rosen (1895-1940), Rutgers College Class of 1916, who served as First Lieutenant in the 315th Infantry, 79th Division. 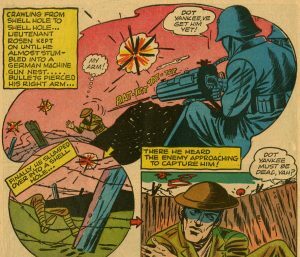 Creeping and crawling toward the German line in search of a machine gun nest on the early morning of November 4, 1918, Rosen found himself in the path of fire. One bullet rendered his right arm useless; the other tore through his left cheek, filling his mouth with blood and taking out seven teeth. The 23-year-old would lose the top of his left thumb, break his left wrist, have his right arm amputated, and suffer impaired hearing and vision before the onslaught was over. He only recovered consciousness as a P.O.W. on the operating table at Longwy, where he remained prisoner for the eight days before the Armistice in November 1918. Commendation letters in Rosen’s RCWSB file stressed Rosen’s status as a medical marvel thanks to a “masterpiece of surgery.” Noting his “gallantry in action and meritorious services,” Rosen garnered high praise from a department dealing with the paperwork for nearly 4 million American troops. Click to read the complete details of Rosen’s “Remarkable Story” from the RCWSB’s Selected Letters, which Earl Reed Silvers intended to turn into a book. But for every story of Great War survival, there are hundreds of stories of heroes who never made it back home to New Jersey. Counted in the tally of the 3,836 New Jerseyans lost to combat, accident, and disease, was Trentonian Russell “Russ” J. Terradell (1897-1918), whose story is housed in the Terradell Family Papers. 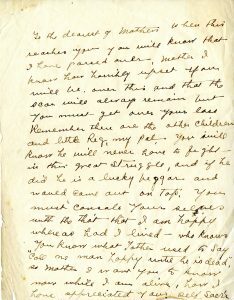 Around a week after Rosen fought in the Meuse-Argonne Offensive, Emma L. Terradell tore open this six-page letter from her son, Private Russell Terradell, 61st Regiment, 5th Division. According to Dr. Richard Grippaldi of Rutgers University, such final “just in case” letters were written by soldiers to their families on the eve of battle since the early days of the Civil War, and remain a custom in combat units to this day. 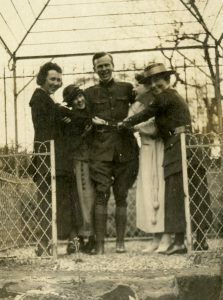 Russell Terradell surrounded by his mother and three sisters Eleanor, Emma “Loretta,” and Streline “Mercedes.” Undated, ca. 1917. Slain-in-action on October 17th 1918, Terradell’s begins with the introductory understatement, “To the dearest of Mothers, When this reaches you you will know that I have passed over, Mother I know how horribly upset you will be over this and that the scar will always remain.” The 21-year-old patriotically justified his death as he attempted to console his family, “But we shall live forever in the results of our efforts. I did not make much of my life before the war but I believe I have done so now. Often one hears ‘Poor fellow cut off so young without ever having a chance of knowing and enjoying life.’ But for myself thanks for all you have done for me. I have crowded into twenty-one years enough pleasures and experiences of a lifetime, and that is why it is no hardship for me to leave this world so young.” The wrinkled onionskin paper still bears the marks of his mother’s tears one hundred years later, and I dare you not to get a bit choked up over this difficult-to-read letter. 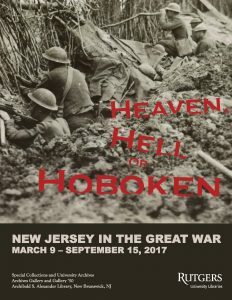 If you’re interested in learning more about New Jersey servicemen like Rosen and Terradell, please check out our latest exhibition, “Heaven, Hell, or Hoboken!”: New Jersey in the Great War. On display through September 15, 2017 in Alexander Library. Curator’s tours are available by appointment, please email inquiries to flora.boros@rutgers.edu.